One hundred percent of the market share in every industry is up for grabs. That's exciting, if you're a startup. It's hard to see change when you're living in the moment but when we look back at this decade the biggest takeaway will be the disruption of retail. The sharing economy has changed how we travel, where we stay, how we do most things. Formerly knows as Quiksilver, Boardriders sells apparel for ocean sports, winter activities, and skaters. The company has already survived one bankruptcy in February 2016, and at the time CEO Pierre Agnes seemed confident in a revival. "The renaming of our company signifies the beginning of a new day at Boardriders," he said then in a press release. "Our teams around the world have been building our resurgence brick by brick. Their passion and tireless execution, along with the loyalty of our customers, suppliers, and partners, has allowed us to complete the restructuring phase of our turnaround and to begin shifting our focus to growth." Bon-Ton operates under a variety of names. The so-called "retail apocalypse" has hit department stores especially hard. Bon-Ton, which has 261 stores, including nine furniture galleries and five clearance centers in 25 states, has been no exception. The company operates under a number of names, including Bon-Ton, Boston Store, Bergner's, Carson's, Elder-Beerman, Herberger's, and Younkers. Supermarkets are not immune to the ongoing retail turmoil. A supermarket chain that operates Fairway Markets, Fairway Group Holdings has already declared bankruptcy once, in 2016. The chain, which bills itself as "like no other market," emerged from that filing in June 2016 with "approximately $50 million in cash, a substantial reduction of its debt by $140 million, and a reduction of Fairway's annual debt service obligations by up to $8 million," according to a press release. That appears to have not been enough, as growing competition has put the company in dire straits once again. Tops Markets are teetering on the edge like many chains. Image source: Getty Images. Another supermarket chain, Tops Holding II, operates as Tops Friendly Markets. The chain, which uses the tagline "your neighborhood store and more," runs 172 corporate full-service supermarkets under the banners of Tops and Orchard Fresh, with an additional five supermarkets operated by franchisees. Just because a chain offers low prices does not guarantee success. Discount chains have largely done well as full-price retailers have struggled. That's not true for 99 Cents Only Stores, which has struggled to compete with rivals such as Dollar General. The chain, which began in the 1960s, operates 350 stores in California, Texas, Arizona, and Nevada. It's worth noting that while the chain appears on the Moody's list, it did have a strong Q1 for its fiscal 2018, where net sale rose 6.7% to $547.5 million over the same quarter a year ago. In addition, same-store sales increased by 6.9% over Q1 2017. Toms was founded on the idea of giving back. The footwear company that was built on a charitable model of donating one pair of shoes for each one it sells may soon need some charity of its own. Toms has given away over 60 million pairs of shoes to children in need since its founding in 2006, and it has increased its charitable efforts into other areas, including creating jobs by making its shoes in countries where it has donated them. David's Bridal sells wedding dresses. A chain that sells wedding and bridesmaid dresses along with other wedding items, David's Bridal has 300 stores in the U.S., along with locations in Canada and the United Kingdom. The company sells in a variety of price ranges but would be considered "affordable," at least compared with most chains and independent shops in the wedding space. Savers takes donations and then resells them. Evergreen AcqCo 1 LP operates Savers, a retail chain that takes community donations and then resells them. It's a secondhand store that pays local non-profits a portion of its proceeds as directed by the consumers who make the donations. The chain has over 330 locations in the U.S. and Canada. It helps "more than 120 nonprofit organizations by paying them for donated goods," according to the company's website, and it " keeps more than 700 million pounds of used goods from landfills each year." Charming Charlie sells trendy accessories. A mall staple, Charming Charlie has been hurt by the fact that fewer people are shopping in malls. The chain, which caters to younger consumers, is particularly vulnerable, given that that group has been the most willing to take its business online. The company currently has over 350 locations, all in the U.S., built around the idea of offering "a breathtaking volume and variety of accessories," according to the chain's website. A luxury brand that, according to its website, is known for using "luxe fabrications and innovative techniques to create a product assortment that combines urban utility and modern effortless style," Vince operates 40 stores and 14 outlet locations. The company has distribution in 40 countries in addition to its own retail locations. Traditional shoe stores have suffered along with other brick-and-mortar retailers. Image source: Getty Images. The owner of the Cole Haan footwear company took over the footwear brand named after its founders, Trafton Cole and Eddie Haan. With a history that dates to 1928, the company has suffered in recent quarters as more consumers have been willing to buy shoes online. That's an emerging trend that's only likely to increase as technology makes things like sizing easier for consumers to do. Charlotte Russe caters to younger customers. A chain specializing in trendy retail clothing, Charlotte Russe offers women's fashion, including a plus-size line. The chain focuses on younger shoppers, which may explain its vulnerability in the current retail environment. In addition, like many other brands on this list, the decline in mall traffic along with the rise of discount trendy clothing brands, has undercut its business. Malls and department stores are not drawing the traffic they once did. Large department stores are hurting, and Neiman Marcus has been unable to avoid the fate of its rival anchoring malls. The chain flirted with the idea of going public, but it dropped that idea given how challenging it would be in this retail climate. The chain has also had talks with Canadian retailer Hudson's Bay (NASDAQ: HDSN) about a buyout, though no offer has publicly emerged. In addition to Neiman Marcus, the chain owns Bergdorf Goodman, Last Call, and other retail/digital brands. Sears has been closing stores and selling assets. Image source: Sears Holdings. An iconic American brand, Sears Holdings (NASDAQ: SHLD) has been a sort of poster child for the current retail collapse. The chain, which operates Sears and Kmart, has been selling off assets, closing stores, and generally doing whatever it can to put off bankruptcy. That effort has so far been a failure, as despite being in full-on panic mode, there are few, if any, signs that the company's turnaround efforts will work. Umbrellas have become easier to buy which makes it hard for Totes to compete. Image source: Getty Images. The parent company of the Totes and Isotoner brands, Indra Holdings has suffered from the overall rise of the internet. Products such as Totes umbrellas or Isotoner gloves have essentially become commodities because they're so easy to buy online. That has diminished the value of these brands, which may be something that's hard for the company to recover from. MAG makes and sells parts for motorcycles and cars. Image source: Getty Images. Operating under the name Motorpsort Aftermarket Group (MAG), Velocity Pooling Vehicle has put together numerous brands that make aftermarket parts for motorcycles, cars, and trucks. That's a challenging business now that the internet has made price comparisons easier, allowing for more competition from both major and minor players. J. Crew makes clothes for men and women. Chinos Intermediate Holdings owns J. Crew, yet another struggling mall retailer. The chain has suffered from the same mall trends affecting other members of this list. In addition, the company has faced increased competition from retailers including H&M, which specializes in trendy but inexpensive clothing, which makes J. Crew seem pricey in comparison. The company recently replaced its longtime CEO, Mickey Drexler, who remains as chairman. Drexler admitted that his biggest mistake was pushing the brand into higher-priced items when the industry trended toward cheaper products, CNBC reported. Eddie Bauer makes winter gear among other apparel. Everest Holdings operates the Eddie Bauer brand through a subsidiary. 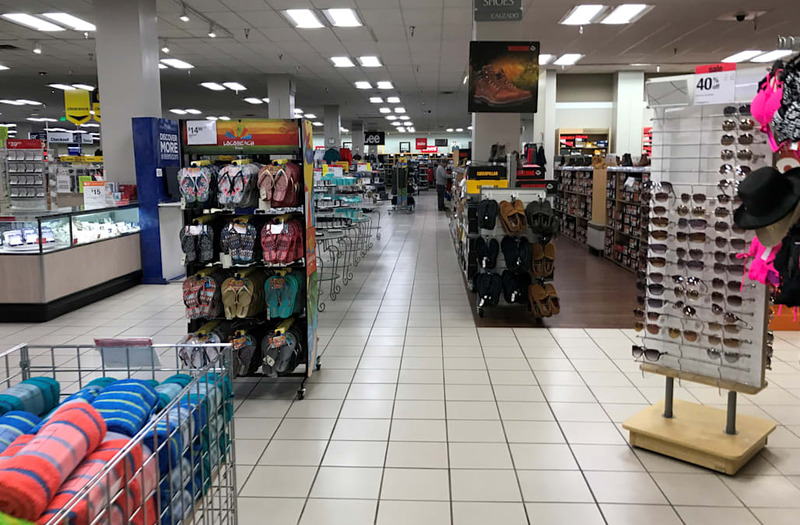 The retail chain has been hit by the same retail headwinds that have decimated the sporting-goods and outdoor-products industries. That has already led to the end of Sports Authority and bankruptcies at Gander Mountain, MC Sports, Golfsmith, Eastern Outfitters, and Sports Chalet. Perhaps the phenomenon was best summed up by MC Sports CEO Bruce Ullery in a court filing reported on by USA Today. "The rapid migration of sales from traditional brick-and-mortar retailers to online resellers, competing distributors, specialty retailers, and changing consumer preferences" contributed to his company's demise, according to Ullery. That's exactly what's bringing Eddie Bauer down and what makes a comeback unlikely. Selling shoes has become a challenge for physical retailers. A maker of shoes and accessories for women, Nine West is yet another mall retailer fighting for its life. The chain has a retail presence in 78 countries, according to its website, and it operates both full-price and outlet locations in the U.S.
Like the other shoe and accessory companies on this list, the company has struggled to compete in the digital era. That's a problem that's compounded by slowing traffic to the malls, where many of its stores are located. Claire's sells a variety of jewelry and other accessories. A chain that specializes in low-cost, impulse-buy jewelry for teenagers and younger girls, Claire's Stores, which also operates the Icing Brand, lives and dies based on mall traffic. The company had 2,680 stores in 17 countries as of April 2017, as well as 901 concession store locations, and 647 franchised shops in 26 countries. If more customers don't go to stores than more chains will fail. Another mall-based chain selling clothing largely to younger shoppers, True Religion has struggled for many of the reasons already mentioned. It also suffers from the fact that it's a once-trendy brand that's fallen somewhat out of favor. That's a difficult problem for many companies to navigate, as it's not easy to transition from hip trend-setter to long-term retailer, or even to ride the ebbs and flows of public opinion. Of course, it's also not helping True Religion that it sells $89 T-shirts and $189 men's shorts at a time when cheaper, trendier options are available. The lesser but just as significant shift has been the rapid increase in what we will buy online. Five years ago curation wasn't a business model. Now Birchbox is a billion dollar company and has spawned a million other businesses like it. Don't quote me on that one million figure but it seems close. Bombfell, Stitch Fix, Trunk Club all curate clothing for busy Millennials who don't have the time or desire to pick out their own clothes. Fabletics picks out your workout gear. Adore Me does the same for bras. Loot Crate if you've got a little nerd in you. You get the picture. Birchbox CEO, Katia Beauchamp, believes that as people share more and more data about themselves they will look for experiences they don't have to "self-navigate" but rather are curated for them based on their preferences and needs. This mindset is not limited to the sharing economy or even retail though. It is being seen in every industry as today's successful companies are looking to change the industry rather than battle for market share in the current industry. "We understand the power of video for business, so we've removed the perceived technical and cost barriers that we find many often associate with creating video at scale," said Chris Savage, CEO, Wistia. "Anyone, regardless of their skill set or role - sales, marketing, human resources, customer service - can easily record and share professional videos to ensure their messages are clearly communicated the first time. Everything has changed. The way we shop, even without curation, has changed. I haven't been to a grocery store in three months. As consumers we have become far more comfortable in what we purchase online, what can be delivered. Five years ago people didn't feel comfortable buying large furniture online. Last year Wayfair made $3.4B. "The retail and consumer goods industries will change more in the next 10 years than they have over the past 40," said Oliver Wright, managing director, global consumer goods lead, Accenture Strategy. "As expectations around cost, choice, convenience and experience continue to increase, consumers will challenge the industry to evolve and innovate which will drive huge growth in digital commerce." What this proves is that there is still room for growth in disruptive business models. Retail is far from obsolete, it's just rapidly shifting market share to future-focused companies. There are rare moments in business when 100% of the market share in an industry is up for grabs. But we are living in on of those moments. As brick and mortars without a focus like Sears struggle, new companies with very specific offerings and low overhead have come to steal that market share. They are not slowed by economy of scale because their lack of storefronts and employees to staff those large storefronts are the new economy of scale. Stranger things have happened but we really are living in The Upside Down. There are hundreds of these examples right now in every industry. Opportunity exists. You can't build a business, hope and expect people to come. It's not that easy right now but don't let existing competition in a category discourage you from entering a new market. If you're not first, you're not last. Second, third, fourth can all be million dollar businesses. While Costco (NASDAQ: COST) never puts up explosive growth, the chain moves ever-steadily forward. The warehouse club has been consistently growing its member base (which is where it makes most of its money) and has been increasing its number of locations by around 25 stores each year. In its most-recent quarter the company saw 6% comparable-store sales growth in the United States and 5% worldwide. Through three quarters of its fiscal 2017 the chain has posted 3% same-store growth in the U.S. and globally. Costco has simply not been phased by the growth of the internet. It has so far operated pretty much as it always has, delivering steady growth, strong earnings, and reliable predictability. Going forward that's unlikely to change and the chain may even be able to add some growth as it steps up its online efforts. In the face of the retail apocalypse discounters have, in general, done well and Dollar General (NYSE: DG) has led the way. It's not that the chain has impressive same-store growth. That number climbed by only 1% in its most-recent quarter and the chain predicts flat to 1% growth this year. But the company has found an appetite for its offering and created a steady model that has tremendous room for growth. Dollar General added 900 stores in 2016 and plans to open 1,000 or more this year. That should keep the chain growing after a year in which it posted revenues that grew to $22 billion from $20.4 billion the previous year. While Wal-Mart (NYSE: WMT) has had its struggles in dealing with online competition, the company has recently found its way. The chain put up stellar Q1 numbers, including raising overall revenue 1.4% to $117.5 billion and increasing U.S. same-store sales by 1.4% on a 1.5% increase in traffic. In addition e-commerce sales grew by a stunning 63% over the same quarter last year. Much of the chain's digital success can be attributed to its putting Jet.com CEO Marc Lore in charge of its full online operation. Lore fostered a start-up mentality and has helped the chain move from being a physical store first to one that meets customers however they are looking to be served. Nordstrom (NYSE: JWN) has proven to have a very loyal customer base that has helped the company thrive even in the current challenging retail market. In Q1 the company raised its EPS from $0.26 last year to $0.37 in 2017 while net sales grew by 2.7%. Comparable-store sales did fall by 0.8%, but the company now does an impressive amount of its business -- about 25% -- through its website. In addition total customer counts rose during the quarter. Best Buy (NYSE: BBY) may be the least likely company on this list. At one point the chain was left for nearly dead. It had fallen victim to being used as a showroom where customers would look at merchandise then order it online from another store. CEO Hubert Joly has brought the company all the way back however by refocusing its stores and aggressively cutting expenses. He also recently declared that the company was no longer in its "Renew Blue," turnaround stage, but had entered a new period. "We are energized about our opportunities and the strategy we are pursuing, he said in the chain's Q1 2018 earnings release. "We believe we are uniquely positioned to help our customers in a meaningful way with our combination of multi-channel assets -- including our online, store and in- home capabilities, and I love how our teams are mobilized to deliver on our mission and Build the New Blue." The TJX Companies (NYSE: TJX) have two things that consumers seem to be willing to venture out to stores for -- low prices and a bit of shopping as a destination. The chain's Marshalls, T.J. Maxx, and HomeGoods brands are all discounters with revolving merchandise. You never know what you will find at what price, which makes it easier for consumers to justify leaving the house. That's a formula that saw the chain grow sales 3% in Q1 2018, which followed a fiscal 2017 where they climbed by 10%. In addition the chain saw Q1 EPS climb from $0.76 last year to $0.82 this year giving the company a 10-12% increase in EPS for the the full year. In addition the chain expects 1-2% same-store sales growth in fiscal 2018 while it also plans to add to the 50 new locations it opened in Q1.